Sound the Trumpet for these Swans! A commotion on the lake woke me up in a flash. The splashing was accompanied by a sound I hadn’t heard here—a deep note, like that of a French horn, with a lingering ring. I ran to the window just in time to see a family of five swimming past our dock. My bird book identified them as Trumpeter swans—the largest waterfowl in North America. The next day they came back and I managed to take photos. What a sight—and a privilege. These swans have had a touch-and-go history in Minnesota and Wisconsin. The last wild nests were located in Heron and Everson Lakes in the late 1880s. The birds were killed for food; their feathers were used for ladies’ hats, and their down, for powder puffs. By 1935, fewer than 70 of these majestic birds could be found in remote areas of Montana, Idaho and Wyoming. That year, Red Rock, Montana became a refuge for Trumpeter swans. Hennepin Parks, Minnesota hosted restoration efforts in the 1960s. Then in 1982, Minnesota’s DNR (Department of Natural Resources) joined the effort by transporting swan eggs from Alaska to Minnesota. 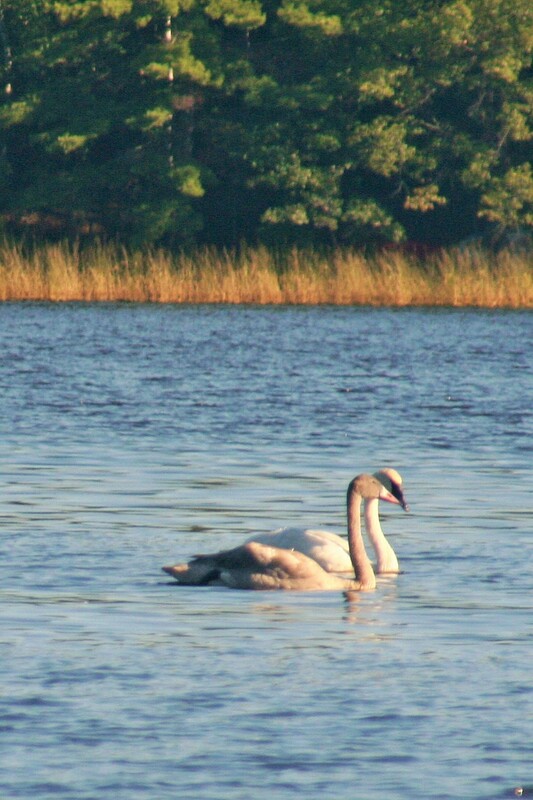 The offspring, called cygnets, were raised for two years and released. Now, over 2000 swans trumpet in Heron Lake, Swan Lake, and St. Croix State Park. In Wisconsin, thanks to the state endangered species act and a public-private partnership, trumpeter swan populations are recovering. Trumpeter swans doubled the goal of 20 breeding pairs by 2000, and were removed from the state endangered species list in 2009. Today, the number stands at a modern all-time high of nearly 200 nesting pairs in 23 counties. You can view them at Crex Meadows in Burnett County and Sandhill Wildlife Refuge in Wood County—or come to White Ash Lake, where we have one family of five. Life Cycle: The male and female build a nest on a muskrat or beaver dam, on a floating mat of plants, or build up enough plants to make a platform. The female incubates the clutch of 4-6 eggs for 34 days. One day before hatching, the chicks begin to peep. Cygnets can swim as soon as their down is dry, but they stay on their nests for a few days. For the next three weeks, until their new feathers grow in, they are brooded by their parents and fed snails and insects from the bottom of the marsh. The juveniles stay with their parents through their first winter until they return in the spring to the same breeding area. Then they hang out with their siblings for 4-6 years until they are mature enough to mate and raise their own young. If a pair uses the same nesting location two summers in a row, they form an almost unbreakable attachment to the site. The swans create quite a commotion when they take off. They run on top of the water with their wings flapping. Just after take-off they pull their necks into an S and then straighten it out. They sleep with their head tucked down under their wing.